Real Milk Comes From What? Which Milk is "Real" ?? 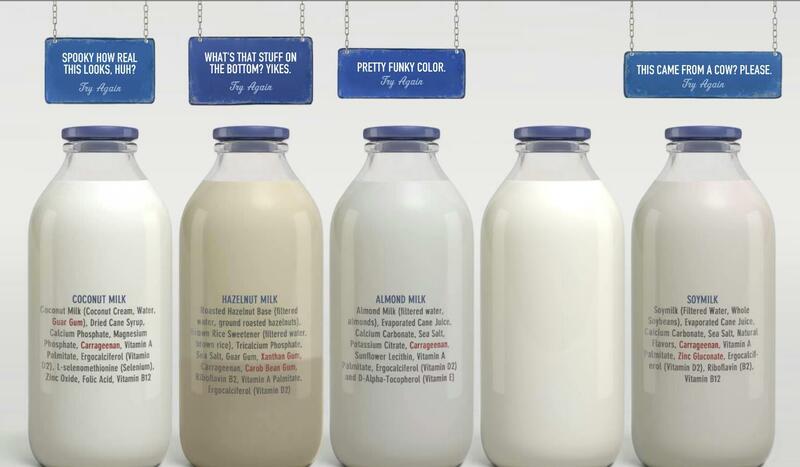 The California Milk Processor Board has launched a new ad campaign asking consumers to guess which milk is real on their Got Milk homepage. I don’t know of anything more real than plants. The ad makes fun of plant based milks with snide comments like, “This came from a cow? Please.” I’m not sure anyone believes soy milk comes from a cow, so this is an insult to the intelligence of Americans. Now I can go on and on about how unnatural it is that humans drink the breast milk from other species. 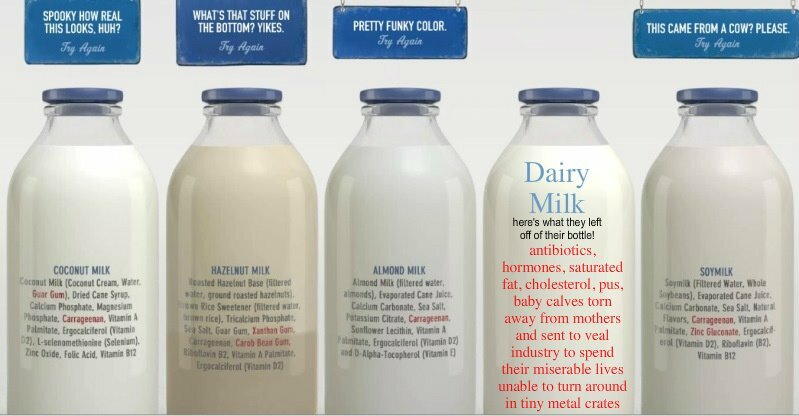 I could go into detail about how unhealthy cow milk is for our human bodies; i.e. sucking the calcium right out of our bones, creating allergies, causing respiratory problems, and increasing the incidence of cancer, especially prostate cancer and breast cancer. I could remind everyone the purpose of cow breast milk is for baby cows to become full grown cows as quickly as possible, to gain hundreds of pounds within 6 months; it’s quite fattening – DUH! But I don’t need to obviously, because this ad shows that the dairy industry is scared; scared of losing their profit because people are realizing the truth and striving to be healthier. Their mud slinging is a sign of something to be celebrated my friends. Americans are learning and accepting that factory farming is just simply: bad. Below is an edited version of that ad, provided by My Vegan Journal. When you play the real milk game, the Milk Processor Board fails to inform the consumer of the icky things in their cow’s milk. My Vegan Journal was kind enough to help them be honest. Shame on them for trying to hide the truth! 6 Reasons to Not Drink Milk – This video by Dr. Mark Hyman is quick and loaded with facts regarding the dangers of dairy. Check it out if you have any doubts or you need a refresher of the facts.